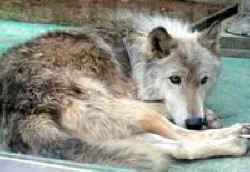 Kei the Wolf, was a North American Timber Wolf who was born in April of 1992. In July of 1992, she and her brother were brought to Japan to spend the rest of their lives at the Okinawa Children's Zoo. Her brother passed on not too long after this and Kei would live the rest of her life alone. 12 years later, a campaign was hatched by Earl Bingley (Canadian Voice for Animals) and Greg Leisure to get her set free. By this time she was living in a 7 x 5 meter cage. The zoo basically let her pace around for years under constant stress in a super-small environment. She had nothing to occupy herself with and was constantly subjected to jeers from people who saw her at the zoo. 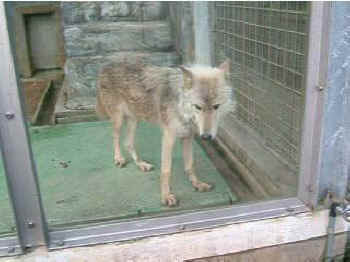 The campaign was to initially get her released from the zoo and brought to possible Wolf Sanctuaries in Colorado, such as Mission Wolf. However the owner of the zoo, Higa Genwa, and their staff were uncooperative. Despite emails, cards, and protests from all around the world, including Japan, they refused to release her. We even tried to take this matter to the Mayor, Nakasone Masakazu, and the former Prime Minister of Japan, Koizumi Junichiro. But they all ignored Kei and her suffering. In July of 2005 PETA would get involved as well, sending their own letters to ask for the release of Kei. Soon after awhile it was deduced that Kei unfortunately had gotten too old and transporting her would kill her. So the focus of the campaign changed to getting her better living conditions. Ultimately she got them in September in 2005. She finally had a bigger enclosure to move around. She had toys, a pool and finally a place to leave the presence of humans should she want to avoid them. She would finally be able to somewhat live in better conditions until she died in June of 2006. Although she died alone, she wasn't ultimately alone because of those who fought so hard for her. As a result, we at Heart of the Wolf our honoring Kei for her courage, bravery, and being able to endure some of the worst horrors anyone has experienced. We also want to commemorate the long hard battle that citizens around the world waged to see that she would be either released or given better living conditions for the rest of her life. We could not have done it without you. As with any memorial, a memorial fund is set up in honor of the brave individual who has died. We plan to set up a PayPal donation section in honor of Kei, called 'Kei The Wolf Memorial Fund', which will be dedicated to the continued preservation of the Wolves and fighting for their rights. Kei had a Japanese name and since she lived in Japan for so long was a citizen, I decided to give her in honor of her, a Kanji character for her name (since she didn't have one). That character means many words. It means: blessing, grace, favor, kindness, mercy, benevolence, charity, bless, show mercy to, render benevolence to. I feel that is what Kei embodied and what those who fought so hard for her showed towards her in return. In honor of the campaign that was waged to fight for her, I am keeping up the old Kei Website that shows the struggle for her, and her struggle to survive in her prison. I want to personally thank all those who were involved with helping Kei and thanks for your efforts to get her better living conditions. 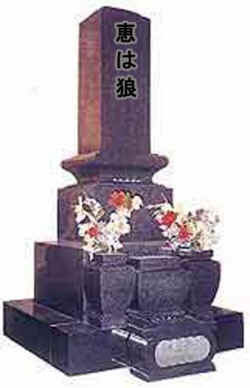 Finally, since Kei has no grave, we at Heart of the Wolf are going to give her one here on this Memorial Site, also in honor of her.